This stunning sage shrub has silver leaves and soft white flowers. It can be from 3 ft' to 8 ft' in height and spreads to about 6 ft' in width. The flowers and leaves are important to indigenous tribes in various ceremonies. 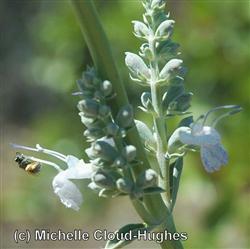 The flowers are arranged on long, pole-like stems and provide a unique look for a California native sage. It is a favorite of bees, hummingbirds, and butterflies.